Announced back at the f8 conference, the Insights dashboard is a revamped set of analytics on (anonymized) user data. It’s mostly targeted at app developers, publishers, and content owners who use Facebook and want to know what their audience likes so they can, you know, keep doing that. 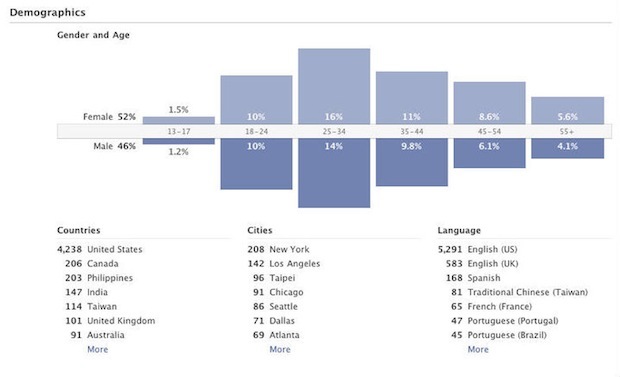 The tools show mostly sharing data, in terms of broad demographics–which stories males of a certain age emailed, or “Liked,” that kind of thing. Those demographics include gender, age, country, city, and language, and are presented in some nice pretty charts and graphs. It’s a nice tool especially as Facebook encourages more app development–now devs can tell who referred their app to customers, how long customers use their software, and how to market it. Just to briefly touch on privacy, Facebook says “this is anonymized aggregate data and does not include personally identifiable information,” so try not to worry too much. You can read Facebook’s brief on the launch here.